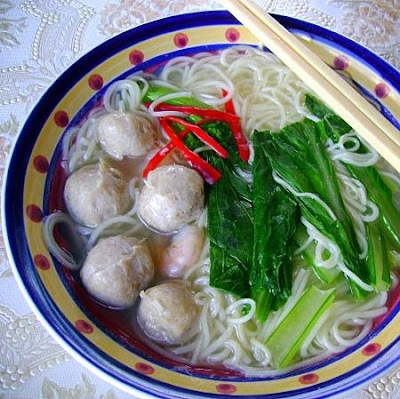 Beef balls is something I always have in my freezer to add to my noodle lunch. The opportunity to make 'balls' out of a different meat presented itself when a slab of frozen pork leg I bought did not turn out to be as tender. The only thing the meat would be good for would be a minced up dish. Reminder to oneself.....never buy frozen pork again no matter how tempting the special is ! The pork balls turned out to be as springy and bouncy as the ngau yoke yuen. The process is the same though I have omitted lye water in this. Any lean cut of pork can be used. And best of all, it is preservative free. 1. Mince the pork in a food processor until a paste is form. Add 5 Tbsp water (a Tbsp of water at a time) to get a smooth paste. 3. Remove the pork paste from the food processor and put in a big bowl. Pour the liquid mix to the pork paste and stir well slowly until the liquid is absorbed into the paste (use either your hand or a fork). 7. Add pepper to the paste and stir to combine. Scoop the paste onto your wet hand. Push the paste through your thumb and 2nd finger by making a fist. Use a wet spoon to scoop and drop it into the hot water. To prevent the paste from sticking to your hand and spoon, wet the spoon and hand with water. 8. Continue until the pork balls form a layer in the water. Now turn on the heat but do not let it boil just simmer slowly without bubble....if not your pork ball will not have 'bounce'. While cooking the pork balls, any leftover paste should be kept in the freezer. 9. Fill a big basin with icy cold water. When the pork balls starts to float, leave for a few more seconds. (Cut one in half to see if it is cook. The inside should not be pink). Scoop out and let it cool in the cold water. 10. After the pork balls have cooled, use as required or freeze. This is a 1 minute video of the whole process of making the beef balls which is exactly the same as making these pork balls. Accompanying song : Great Balls of Fire by Jerry Lee Lewis. Didn't know it was sooo easy to make these!!! Definately going to add this one to my "To-do" list! I was wondering if you know how to make "Fun Tei" (Pork Hock/leg?)? I would love to learn to make this. Hi Tricia, sorry don't know what Fun Tei is. Your to-do list is getting longer. Just found out the dish I wanted to learn is called "Yuen Tei" LOL!!! Hi Tricia, I do remember eating Yuen Tai in a restaurant way back in Msia but no recipe ! Finally made this today. Mine turn out no very bouncy and many-many different sizes!! LOL!!! Don't know why I could make a uniform size!!! Guess my hands weren't "Talking" to each other!!! I was so afraid to NOT let it boil, it took over 1/2 hr to finally see the balls started to float!!! Still have some pork leftover. I will try another batch tomorrow. I use a 'rounded' measuring spoon which makes the balls very even. It shouldn't take half an hour for the balls to float. It should happen quite quickly. You will find the first few balls will actually start to float a few minutes after you put them into the hot water. What I do is before I start making the balls, I make sure my water is at boiling point before switching it off and then I start the 'squeeze' process. Once you are ready to cook it, crank up the heat initially to get it off to a quick start (just don't let it boil). If you have a gas stove then it is easier to manage the heat as the reaction is almost instant. The balls will float very quickly unless your water has gone really cold while you were making your balls. When some of the balls start to float, pick one up with your fingers and give it a squeeze. If it has a hard bounce, cut it in half. If is not pinkish then the rest of your floating balls are a few minutes from being done. From experience, pork have a harder bounce when you squeeze it. If the bounce feel soft, throw it back in the water for a minute or so. I don't expect you to squeeze everyone of the balls (ha ha) especially if you are making 100s of them. If the balls pass the bounce test, don't worry too much that they might not be 'cooked' enough at this stage. You can boil them to death later for your noodles as it won't affect their bounciness then. Don't throw away the water as you can use it as stock for your noodles or soup. Thank you Sinner for your tips. When I watched your video, it looked soooo easy. But when I tried to do it ... it wasn't that easy. I used the rounded spoon (measuring spoon)like what you were using, too. Anyway, I will try again tomorrow with the rest of the meat I have left. I drop by your site & notice that a lot of nice foods here. I tried your "chu yoke yuen" & homemade noodle recipes last weekend & it turn out really good & delicious. Thank you very much. Hi Janice, glad you like the chu yoke yuen and homemade noodles. And yes I am Malaysian. I am planning to try it again and hope that it'll work..is there any specific pork I should be using? What brand of fish sauce and how old is it ? The cooked balls has no hint of fish sauce as one of the ingredient. It could be the pork ! As for pork cut, since it is minced up, any cut will do. Get a cheaper cut. Mine was meat cut off from a pork leg. It does take practice sometimes to perfect a recipe. Have a look at my comment above (29/10/08) with more tips for this recipe. Maybe try half or quarter of the portion next time. My fish sauce is squid brand and I've had it for quite some time (could that be the problem) I sniffed it before keeping it after cooking it. I'm hoping that the odor will not be there when I'm ready to cook it. Does it mean I should not keep the fish sauce too?? Sunshine, I really can't say whether your fish sauce is the problem. We did the sniff test on our Golden Boy brand. There is no odour - it actually smells quite nice, it doesn't 'hit' you in the nose (no pong). Fish sauce is pretty cheap. I think I got mine for under $3. See if you can get Golden Boy. It is supposedly a premium brand. My bottle gets used pretty quickly. Plenty of recipe in my blog that use fish sauce. With your pork ball smell, I guess it is a process of elimination. If it still smells even with a new bottle of fish sauce, maybe try to split the meat paste into 2 batch and don't add pepper in one batch. I had another read at your comment. Do you mean the pork ball smell was the same as your bottle of fish sauce ? If that is the case then definitely buy a new bottle. Would love to hear how you go in your next batch. Sinner! !I just had my pork balls with my instant noodles! !OMGOSH they are awesome...they taste really really yummy..
Back track..the pork balls smells like urine (a little) after I cook it and soak it in the cold water. it still smelled like that a little after I was keeping it away to freeze. However I took some out today and cook it with my instant noodle I could not smell it and it tasted wonderful. I really like it.. Thanks for the advice!yummy balls..will try and make another batch when this is almost done.. When I first started shaping the balls, mine too came out looking very odd. But since it is only for my own stomach - no matter. I do these balls about once every 3 weeks and even then still loose the coordination initially. Do persist, you might find it will be faster in the end. I just had fresh fish and pork balls the other day and I gotta say, it's sooooo much better than the frozen. I'm so glad I found this recipe, I'm definitely doing this in the future. mycookinghut, thanks. Would love to hear how yours turns out. gaga, was it as bouncy with fish? Have not attempted this method with fish myself. i made this today and wow..so bouncy. thank you so much for the recipe. LOVE this recipe and I love the video, too. Thanks Sinner! First time coming across your blog. I'm hoping to make some of these pork balls soon. However, I do not have a blender/food processor. Do you think it will be okay if I just minced it by chopping? that is one good tutorial! Thanks so much for the recipe and video. I grow up eating all kinds of balls, but have no idea how they are made! The food processor grinds the meat into a paste which makes the cooked meat balls very smooth and bouncy in texture. If you are going to mince by 'hand chopping' you will end up with an ordinary meat ball that might not 'bounce' and the texture not as smooth. Happy to share. Thanks for your comment. Chu yoke yuen is my favourite. I'm glad to find such a great recipe plus tutorial here. Feel like trying it out immediately! Go on....dive in! It is worth the effort. 3. Did you use your fingers to push out the paste or a spoon. hi sinner good i tried this for several times but i cannot make it perfect. the meat ball is soft and easily break and not smooth in texture any more advice. or maybe the flour is not enough?? thanks..
Hi gigi, can you answer the same questions I asked jm above? simmer is corn flour and corn powder desame?? Are you using a food processor to mince your pork ? The whole process from mincing, taking the meat paste out and then stirring the rest of the ingredients into it, should not take you more than 5 minutes. Then it goes straight into the freezer. And there should be no trace of meat. Half an hour is way too long for a food processor - check your blades. Don't be tempted to change or substitute any of the ingredients or change the steps until you have got it right. When you say the 'texture is not smooth' - do you mean the outside or the inside. For the outside, if you watch the video closely, you will notice my hands and spoon is wet and I use the back of the wet spoon to smoothen the paste. I don't know what corn powder is - maybe ask your sister to look at the back of the packet and see what the ingredients of that are. I don't think I have much more advice to offer other than to watch the video closely (there are no tricks) and to read some of the other comments I have made above to other questions. The recipe does work - maybe you would like to half the recipe until you get the hang of it. Mine is a Breville. It is quite cheap and does a pretty good job. hi sinner it me again gigi i always visit this site for more good food to learn.. can u please give the the site or any photo that i can see the kind of blender ur using specially the Breville u mention.. i think the right equipment make ur food taste good thanks again..
You can see a pic of my food processor here. Mine is already 5 years old. Considering the amount of work it has done for me, it has lasted a while. I also have an old food processor and like yours the blade is blunt. I use the old one mostly for making pastry. I have tried twice and quite satisfied with the output although the balls on the 1st attempt was quite huge. Imagine, having 27 pieces instead of your recommended 48. So pleased that I could make my own pork balls for my soupy meals. In my head I keep seeing your pork balls like those yum char ones ;) Love those big yue tan. So glad you tried these bouncy ball. Since pork is getting so expensive here, I have been using chicken meat. Will the texture of chicken meat as bouncy ? Then I should try too. What do you think if I add in some chopped corianders or maybe spring onions ? The chicken balls are just as bouncy. Only difference is the colour - it is whiter. I think its worth trying out. Will keep you posted of my result. Hello Sinner, I wonder any of your friends on the blogs tried prawn balls. I understand you need to mix a bitof pork fat to make prawn balls. Have you tried yourself?? I don't recall anyone have commented on making prawn balls yet. Personally I haven't tried with prawns. So far I have only tried with beef, pork and chicken. I don't know Quentin as I always have baking powder in my pantry. Never had the need to substitute. Thanks for your superb blog! Just tried your porkballs. It was a breeze to make and turned out nicely. Do you save the boiling water to be used later as broth? So glad you liked the porkballs. I do save the 'water' for noodle soup or as stock for other dishes. I can't download your beefball video. "It says it's not available in your country due to copyright..."
Did you copyright it ? Nup...not me ! UMG and Sony have been nitpicking at videos with music content and have blocked them from being viewed at certain countries. First of all thank you very much for sharing your recipes with us. I love your blog very much. I do have a question regarding the bouncing meatballs. If I want to make boucing chicken balls, do I have to add lye water like you did in boucing beef balls? Thank you in advance. Nowadays I omit lye water from all my bouncing balls :). With lye water they might bounce a little bit more but difference is negligible. So to your question of chicken balls, you do not have to add lye water. It will be just as bouncy. Would love to hear your feedback after you make them. I have a pack of 500g minced pork sitting in my fridge now. Do you think I can use it to make this pork balls or is it better to buy a slab of pork meat & mince it in the food processor? After having success with yr chic balls, I can´t wait to try out the pork balls. I told myself I will never have to resort to buying frozen meatballs from the Asian grocery here anymore. Plus like you said, it´s so much healthier to make it at home without all the preservatives. Thanks for your advise. Since you have already bought minced pork, you might as well use it. You still have to go through the food processor stage to get it to a paste, though it will be a tad faster since yours is already in the minced stage. Better to buy a slab of pork meat for next time as then you control the fat and the quality of meat. Here mince is cheaper than unminced meat - lots of fat in it ! Had your chu yook yuen meen yet ? Hi Sinner. Have made your bouncy chu yoke yuen and they are fantastic! The first time, I made exactly according to your recipe. Second time, I added dried squid to make those squid meatballs that the pork noodle stalls use. It was excellent!! Here in Abu_Dhabi, the mince is quite good with minimal fat. Price is almost the same as fresh meat, so I have no problems getting it. We have frozen pork leg cubes (boneless). Can we use that to make the meatballs? Dried squid...what a fantastic idea. Shouldn't be a problem using frozen pork leg for this. Glad you like the chu yoke yuen. I am guessing pork at Abu_Dhabi must be expensive. Here the price of pork is on the up and up ! Ridiculous ! hi! Just tried your recipe and the pork balls turn out really good! thanks so much!! Will try next time with fish and beef! No more spending on the frozen stuff that costs a bomb in the local asian stores in Sweden! Thanks for the feedback. This will give encouragement for those readers who haven't quite got the hang of making the 'balls' yet. Thank you so much for this wonderful recipe and the great joy it brought to me and my family. I tried it and the result was wonderful. Now I don't have to go Swatow (China) to eat this wonderful dish. By the way - will it work on Sotong ? I love sotong balls too. I planning to try with Sotong - do you have any advice on that ? I too love sotong balls but haven't tried it yet. If you do try it, would love to hear the outcome. Thanks for the update. I can only get fresh white squid here. Don't know if that will work. It is not cheap either. Good on you for experimenting ! If you ever try with Sotong, I suggest you try with the sotong body only first. My few attempts with the sotong wings and heads had failed so far, and I am not sure why. I will try mince the head and wing very coarsely and mixed it to the fine sotong body puree to enhance the texture next time...and if that still fails to work well , I will save the heads and wings for making otah. Thanks for your tip on the sotong Chengteck. Is it the remaining water from the 125ml of cold water?Sorry to bother you. No bother at all. Happy to answer any question. Yes, the remaining water is from the 125ml of cold water (leftover from step 1). I tried this recipe and the balls turned out really yummy and bouncy. I only used 300g minced pork cos I was already serving it with some herbal black chicken soup with mee sua. I think next time I'll try it with chicken/beef. Can the meat be marinated the night before in the fridge of course (not in the freezer otherwise it will solidify) and then placed in the freezer the next day for 30 mins? So glad your pork balls turned out great. Mind if I ask why you want to leave the mix to marinate overnight ? Oh I just thought the next day will be easier for me. Just boil the soup and make the noodles. Just saves time, that's all. So is it ok to leave the mix to marinate overnight and then dump it in the freezer 30 mins before cooking? By far the easiest way would be to cook all the balls and freeze them. I always have a bag of them in the freezer. That way, pork balls, chicken balls or beef balls are always on call whenever I feel the urge to eat noodles. Personally I wouldn't leave the raw mixture uncooked any longer than is necessary. The reason being baking powder would start losing its 'rising' effectiveness over time. But if you do leave it overnight, I would love to know whether it made any difference to the texture and bounce of the pork balls. they still turned out quite bouncy and nice. However, i do notice that some are only 1/2 cooked if they are just taken out of the water when they float. I simmer them in barely simmering water for 1 minute at least to ensure they are cooked properly then dump in water. Will they still be good as in not lose their bouncy texture if u simmer them in the soup just to warm through for bout 30 secs before serving? By the way how do u get such perfectly round shapes? Mine are still kind of rough and jagged. Oh, would this method be great for fish paste balls? Good to know they were still bouncy. Once you have completed 'Step 10' and the pork balls are bouncy, you can boil or cook them more thoroughly for whatever length of time. It will not affect the bouncy texture. By the way, I have an immersion stick blender, can this be used instead to blend the minced pork into a paste? I have to say, I haven't got a clue, Lilian. I have always use a food processor. I cant find fish sauce in my country. what can I use instead? or will the taste effected seriously if I dont use fish sauce? What is the purpose of baking powder in this recipe? Have you tried making the Chu Yoke Yuen WITHOUT the baking powder addition? I'm making for a friend who's sick so that she has frozen but good & natural food in her freezer to draw upon. Hence, wondering if omitting the baking powder would affect the recipe much. Can I substitute pork with chicken? Hi Sinner, I've found that the previous comments praised your video demonstration. I tried to click on the video link but it's no longer there. Can you kindly link your video so I can have an idea how's it being done generally? Thanks in advance!